If you’re a pasta lover, I have a healthy summertime calorie-saving tip for you. The thing is, I’m usually into the pasta for the sauce. That would be homemade or store-bought pesto lately. 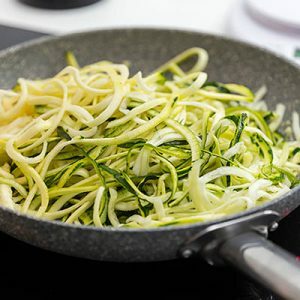 So, I use a spiralizer device or food processor to shred zucchini into noodles. I fry those in a little olive oil for just a few minutes, then add a generous amount of pesto. Then, I toss quickly to incorporate the pesto, and serve. Add freshly grated cheese on top, if it’ll make your day. Kids like it too because zoodles are just plain fun.